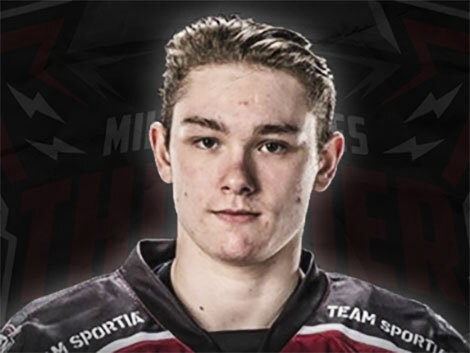 Invicta Dynamos Head Coach Kevin Parrish has added to his roster ahead of the weekend’s double header of away games by signing Great Britain under 18 international Lewis English who started the campaign with the Milton Keynes Thunder. Lewis English rose through the ranks in Slough where he captained the under 16s in 2014/15 and managed 43 points in 16 games whilst also featuring for the under 18s A and the under 18s B. The following term he claimed 24 goals and 11 assists in 18 fixtures whilst donning the ‘A’ of alternate captain for the under 18s A in addition to stepping up to feature for the under 20s. In 2016/17, English took his game to Europe, specifically Boden in Sweden, and he gained experience for the under 18s side as he featured 31 times and notched 8 goals. He would remain in the Nordic country the following term with outings at both under 18s and under 20s levels that drew the attention of Great Britain’s junior coaches. As a result, English was part of the GB team that secured promotion from Division 2A at the World Junior Championships in Estonia in April 2018 by bettering Lithuania, Poland, South Korea, Estonia and Australia. Lewis English returned to the UK for 2017/18 where he signed up for the Milton Keynes Thunder but after 11 games the forward has opted to move south to line up for the Invicta Dynamos for the remainder of the campaign. English will don the number 9 jersey in Kent and will be thrust into the action immediately as the side go into two road games this weekend – travelling to the home of the Peterborough Phantoms on Saturday before then facing his former employers the Milton Keynes Thunder in Buckinghamshire on Sunday. “Lewis is still only 18 and is still developing as a player but I believe he has an exciting future and look forward to working with him for the remainder of the season”. This entry was posted	on Friday, November 23rd, 2018 at 7:00 pm	and is filed under Featured, Ice Hockey, Other Sports. You can follow any responses to this entry through the RSS 2.0 feed. Both comments and pings are currently closed.